It was a classic David versus Goliath moment. At the December 2007 United Nations Climate Change Conference in Bali, Kevin Conrad challenged the U.S., the sole holdout on a plan for a post-2012 climate treaty. "If, for some reason, you're not willing to lead, leave it to the rest of us," he declared. "Please, get out of the way!" Within minutes, the U.S. backed down. The resulting "Bali Action Plan" provides a road map for an international climate treaty that will succeed the Kyoto Protocol. The Bali agreement was significant for Conrad, who was there as Papua New Guinea's Special Envoy for Climate Change, because it contained provisions for which he'd fought for years. For the first time, the U.N. Climate Treaty agreed to recognize the role of tropical forests and deforestation in tackling global warming. This issue has long been central to Conrad, 40, who was raised in a small village deep in the rain forests of Papua New Guinea. 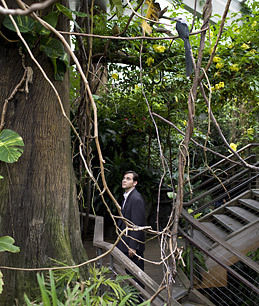 He first addressed deforestation as a graduate student at Columbia University. While there, he sought my assistance on how the international community can provide incentives for conserving rain forests. He knew that without payment for environ-mental services, which have been excluded from current climate-change agreements, countries like Papua New Guinea simply cannot protect their forests. Momentum quickly shifted after Conrad secured the support of two visionary leaders, Prime Minister Michael T. Somare of Papua New Guinea and President Oscar Arias Sánchez of Costa Rica. Making the case that deforestation in the developing world accounts for 20% of global greenhouse-gas emissions, Somare and Arias have called for countries that preserve their rain forests to be compensated. Conrad is at the vanguard of this movement as executive director of the Coalition for Rainforest Nations (CfRN), an intergovernmental alliance of over 40 countries that has emerged as a formidable force within U.N. climate negotiations. At the CfRN's request, the World Bank established the Forest Carbon Partnership Facility, which has raised $172 million to support analytical work and capacity building to reduce deforestation. More recently, Norway has pledged $2.8 billion to combat deforestation. Sparked by Conrad, Somare and Arias, these initiatives may mobilize the largest sums in history to support rain-forest conservation. Conrad's Bali stand was no mere act of bravado, but evidence of a powerful phenomenon: a giant bloc of developing nations demonstrating more determination in the face of climate change than an industrial giant. Driven by this same sense of urgency, the CfRN represents a vital partnership between developed and developing nations that could significantly mitigate climate change. As Conrad's call to arms reminded us, what we need is precisely this kind of leadership, wherever we can find it.